Xiaomi has launched Redmi 7 and Redmi Note 7 Pro in China. Redmi 7 comes with Snapdragon 632 Processor, 4000mAh Battery. 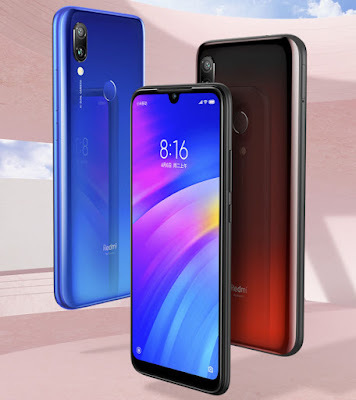 Redmi 7 has a 6.26-inch HD+ IPS display powered by Qualcomm Snapdragon 632 octa-core processor with 2GB RAM, 16GB Storage, 3GB RAM, 32GB Storage and 4GB RAM with 64GB storage options. Redmi 7 comes in Black, Red, and Blue color options priced at 699 Yuan for 2GB RAM,799 Yuan for 4GB RAM and 999 Yuan for 4GB RAM. Redmi 7 price in Malaysia RM499 2GB+16GB, RM599 3GB+32GB Sale on 27th March. Price in Philippines PhP 5,890 for the 2GB+16GB ,3GB+32GB variant for PhP 6,490.Both models will be exclusively available on the official Xiaomi store in Shopee starting April 19, 2019. They are also having a flash sale on April 5 at 12PM with the 2GB+16GB version only priced at PHP 5,290 while the 3GB+32GB will be offered at PHP 5,990.